Next PostWhy Do Lithium-Ion Batteries Explode? I use my RP-B055 to power my portable CPAP machine. This allows me to travel on long distance flights without worrying if the power plug works on the aircraft, covers off spotty power in remote locations, and also allows me to go wilderness camping off the grid for multiple nights. The run time of a 99 AH power pack over the largest available battery from my CPAP supplier (5.5 AH) means a lot more freedom! Wow that’s a great way to use our power bank. Quite novel too. We’re glad we make flying and camping easier! Can I know how many night of CPAP use it will last on one full charge before charging. In the last year or two there have been some changes in the rules for chargers and power strips on cuise ships. Particularly with regard to surge supression, which apparently interacts with the electrical systems of these ships in potentially dangerous was. I have the Ravpower rp-pc028, 6 port usb hub. Does that unit have surge suppression? Have you had any feedback about this charger vis a vis cruise ships? All our USB Chargers have surge protection, and from what we understand, they can also be used on cruise ships. Wishing you the best on your travels. You need to update your advice given in light of restrictions in and out of certain countries deemed at risk of terrorism. There is a physical size limit on such flights …. the thickness of the powerbank is usually the limiting factor…1.5cm. Thank you for the heads up. We will update this page to reflect this. The restriction is only for few countries, most of them from middle east on flights to US or UK. If the battery size is not too big, then it should be okay. 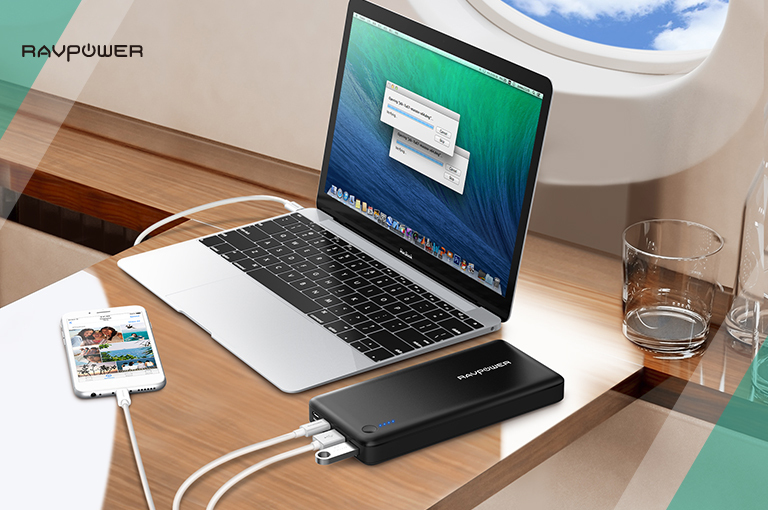 Hi there just wonder if RAVPower 27000mAh Portable Charger with Built-In AC Outlet able to bring up to the plane? Understand that it is 101W need approval from the airline and RAVPower 27000mAh is at 100W. Will that 1W difference make the airline to reject for safety reason? You are right that 101W devices need approval, however, the RAVPower 27000mAh is at 99.9W – just under the limit. You should be able to fly with it. Have a safe trip. We’re actually not sure about this answer right now. I think it would depend on the airline. If you do find out the answer, please share it in the comments! Some airlines may impose their own limits as you say, and if you’re flying somewhere with “enthusiastic” baggage screeners, a big stack of batteries is the sort of thing that’s likely to make them twitchy, so definitely check with your airline or travel agent if you’re planning on taking a lot. Is there a powerbank for new surface pro 2017 which I could carry it on airplanes? This may be suitable for you: RAVPower 20100mAh Power Bank with AC Outlet. We hope that helps! What is the Nominal Voltage of my power bank with Quick Charge 3.0? Could you tell us which model power bank of ours that you are using? That will allow us to provide a more accurate answer. Thanks. Nominal voltage refers to the battery voltage, not the output voltage. If its lithium Ion then use 3.7v. Will I be able to fly with my RP-PB055? Thanks! Yes you can. 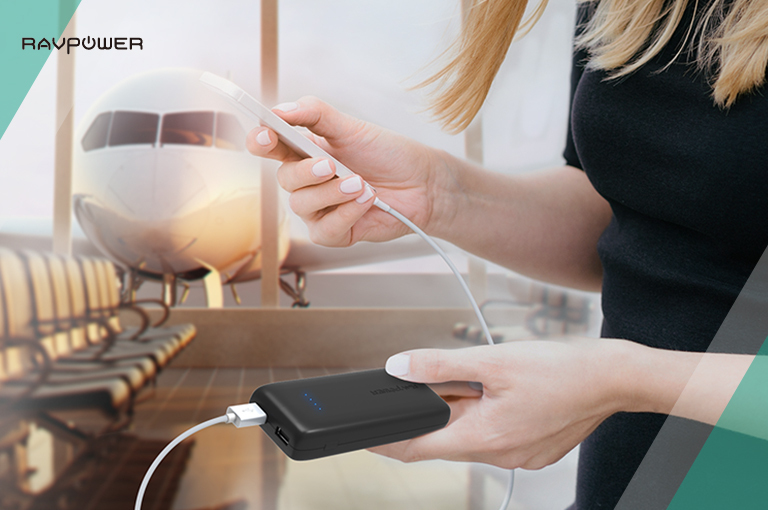 The RAVPower RP-PB055 27000mAh Portable Charger has a 99.9W rating so it can be brought with you on a flight. Let us know if there is something else! Thanks for this great write up! Exactly what I was looking for. I’ve spent that last 2-3hrs researching powerbanks, usb cables, and wall chargers for my Nintendo Switch. While I’ve flown internationally and have never had a powerbank taken away, the last thing I want is for that to happen…Especially on a 12+hr flight! We’re glad this was informative. Let us know if you have any topics you would like to see addressed on the blog. Cheers! 26800 / 1000 x 3.7 = 99.16Wh. Since it is just under the 100Wh limit, you can bring it on board. Where does the 3.7 come from? Isn’t the voltage output 5V? Can I bring multiple power banks under 100 Wh? Like two 95Wh power banks? That depends on the airline. We will have a future post to address this. We can use Power Bank in the planes. I was going to say this is such a blatant advertising for Ravpower, and then I looked at what website I was on, lol. Gah, i need to pay more attention. Hahaha no worries! Glad you found it helpful. Do you have any external power banks that can charge a laptop and are also allowed on flights? 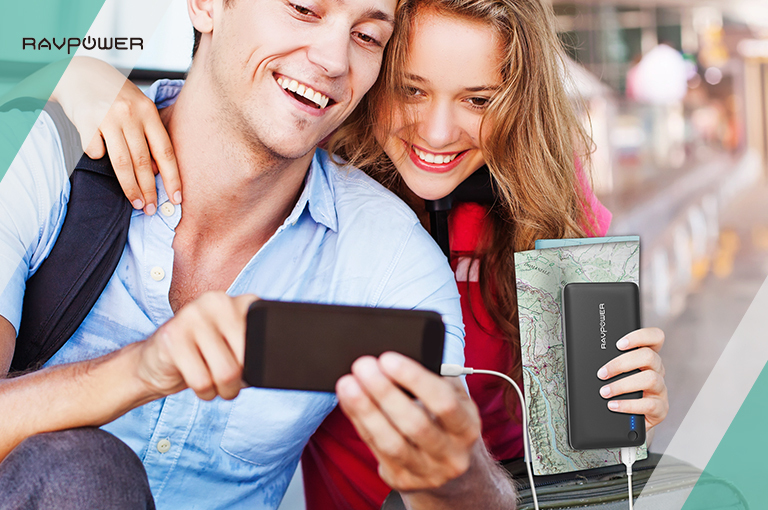 We have three options that we think will help you: our RP-PB055, RP-PB054, and RP-PB14 portable chargers. Let us know if you have any other questions. Maybe you can help, I’ve got a Comsol np200 and its got variable voltages so I don’t know how to calculate the watt hours. Calculated at 5v its at 100 watt hours, but calculated at 19v its at 380 watt hours. But i fail to see how the battery can be both of those. We are not sure as well as it isn’t one of our products. You can check the NP200 user guide for more info. I wonder why when they have Airbus 321s… Anyway thanks for letting us know, Sean. Have a PB-19 and fling to Florence, Delta and Air France. The watts are fine at 69.1, but how do I know about the no more than “2 grams” of lithium issue???? You will be fine flying with that. That is up to your airline to measure. If you do wish to calculate it, check this link for the formula. Can I carry this in KLM international flight. 26800mah / 1000*5.5amp = 147.4MH. Where is the 5.5amp coming from? We recently bought RavPower 26800mAh model RP-PB41. I can’t seem to find the voltage for this specific one. Where can I find the V for this model? And will this be allowed in air travel? For the battery cell, the voltage is 3.7V (the nominal voltage). The power bank’s input voltage is 5V. Or if you want to know which charging adapter is suitable when travelling, our power banks support 110V-220V. FInally a post with exact details and simple math for calculations. It just came to mind last minute that I may need to check if my powerbank was going to be allowed on my flight tonight or not. That’s good advice. I will pass this info to our website management team. Hopefully they update it soon! Thanks. What is the best battery for travel on the airplane with maximum (100) WH allowed and fast charging? It’s gonna be a long 18 hour flight.. plus train and bus rides afterwards. Can I take the RAVPower 23000mAh Portable Charger 4.5A DC Output External Battery Pack on a plane? Yes you can. It is within the 100Wh limit. I purchased model # RP-PB052 22000 mAh charger. On the back of the charger it says it is 83.6 Wh. Is this referring to 83.6 watts? Also in looking at the formula to calculate the watts to make sure the charger is allowed on the airplane carry-on within the 100 watt rule how does this calculate out? What is the volts of this model. According to the back of the charger it shows for Input: DC 5v/2.4A Max. Then it list Output/(iSmart): DC 5v/5.8A Total. Using the formula on you ad fro this model and using the numbers on the back of the charger I calculate: 22,000/1000 x 5.8 v = 127.6 watts. Is is correct? I will be flying the end of the month and don’t won’t the TSA to take my charger. The listed Wh on the power bank IS the Watt Hours. Since it’s under 100Wh, you can take this model on your flight. Just show TSA. We are not sure why you used 5.8 as that is the output of the device. The number you need is the nominal voltage which is around 3.7. I have a powerbank that can output 19v, 16v, 12v and 3.7v and has a mah of 20000. Can I bring this powerbank? In this case which voltage would we use to calculate as the nominal voltage? Since it’s less than 100Wh, it can. Is the RP-PB14 allowed on flight? That one should be below 100Wh hours so it can be brought on board as part of your carry-on luggage. May I take in my bag in a commercial plane a PowerAll Goliath 32000 mAh Power Bank 800 Amp 24V Jump Starter LED PBJS32000RG in the US ? That’s above the 100Wh limit. You need approval from the airline to bring it on. I recently bought a 100000mAh power bank with an input of 1 A and output of 2A, the model is telecomusers, will this be allowed in hand luggage? I don’t think so as the battery is 100,000mAh. That will exceed the 100-150 Wh limit. I have a Mophie 5200 mAh and a Mophie 10,400 mAh. I know these meet the guidelines of under 100 Wh but are they ok as far as having the internal protection? I tried to look but can’t seem to find that info anywhere. Also, can i take both with me? Hi there. Thanks for this information, but what we’re running into while looking for the right power bank is lithium batteries are not allowed at all through SeaTac Airport, Seattle, WA and most power banks have lithium type batteries. So, with all the commentaries saying they’ve been okay, we’re confused. I haven’t bought one as it would be useless to us to have it confiscated between flights and some TSA pockets it. Alaska Airlines also notes no batteries on their flight, even though your notes say 100wh per federal aviation rules. I’m an “old school” traveler, so I’d just plug my electronics into outlets in airports for charging while waiting to board flights and before getting to airport. However, traveling to remote destinations in various countries around the world, they don’t have access to cater to my laptop, ipod, phone, etc. So, this power bank would be great even for a day for some things. The CPAP idea for my hubby noted above sounds fantastic, so can anyone recommend what powerbank size to use in this case and does it have a lithium battery? Thanks. Kindly let me know will this be allowed in cabin? AC Outlet 27000 Power Bank https://www.ravpower.com/dp/B07546KNVC?ref=emc_b_5_i It’s just perfect for me. You said in another answer that you can fly with it. Problem is that I’ve got to go to Japan where Law is God and the specs about that powerbank say it’s a 99.9 Wh one… It’s at the limit and fine with me BUT the Japanese legal restrictions explicitly state that it MUST be LOWER than 100 Kws. If that isn’t true I’m gonna be f**** by the Imperial custom officials and I’m not speaking about Star Wars. Man, you must assure me! Another question is… How do I know how much lithium that thing contains??? If you are having doubts, then contact the airline. Remember you can get special approval from some airlines to fly with a power bank between 100 – 150 Wh. As for your question regarding how much lithium it contains, do you mean how many lithium batteries are housed inside? Just back from a trip to Australia to Shanghai- power bank was taken by airport security at Pudong (Shangahi) airport- Was in carry on and only small and met all these guidelines -No reason or arguing with them- Just advised not allowed powerbanks on planes. Chinese airlines seem to have their own rules. From what we’ve learned, you need to fill out a form to bring power banks on board. So interesting to see this comment because I was just leaving from Pudong to JFK on China Eastern last weekend, and they took away my little credit card-sized charger that I got as a promo gift ages ago. I’ve carried on that mini-charger all over the world for years without even taking it out of my bag. Pudong did let me carry on my other, large-capacity portable charger. But the agent who threw away my little charger (which obviously doesn’t exceed any lithium limit) told me that if it doesn’t state the capacity on the exterior, then they can’t allow it, so maybe that was the case with yours. So they do let some portable chargers through. I think it depends on which agent you get and how much the government is cracking down that day. I’ve never tried registering a charger beforehand. Hello, I’m from Mexico but i live in Shanghai and i have taken many flights from Pudong and Hongqiao Airport (both in Shanghai) to many places… I always travel with 2 powerbanks, both are 20,000mAh (each) and never had a problem. Sometimes they only check the WH… But in both powerbanks it shows 74wh… Just in any next case, try to follow all the rules before the agent have to ask you if you are carrying any powerbank… I means, take the powerbanks, laptop and cellphone out of the backpack before they ask you. That way you will show them you are following the rules and that way you are showing them you also know that rules. PS: 90% of the chinese travel with powerbanks… and due to a very hard restriction in the last years, you are not allowed to put any kind of batteries or lighters in your checked-in bags. Never have any problem bringing power banks onboard and clearing Chinese customs. Follow these rules: remove the power bank from the check in bag, total power less than 100WH, batteries MUST have clear readable label indicating the power. Hi! This is very informative since i am actually searching for the allowed powerbank capacity. I do have RP-26800mah and is quite doubtful if this be allowed in hk and macau. I’m sorry that I didn’t buy a rav power source but I did buy a ruipu brand and am wondering if you could tell me if I can fly with it, capability is 24000 mAh input DC5V 2,1 A output DC5 V 4,2 A. Not 100% certain but it seems like you should be able to. Are solar powered power banks allowed as long as they are under the 100W limit? Considering they are two separate units, there should be no problem. Of course its best to check with your airline before flying just to be safe. I bought RAVPower 26800 mAh Power Bank from Saudi Arabia. Is this comes under 100 WH? I am in confusion whether airlines allow me to carry or not, could you please clarify? If it’s a legitimate RAVPower power bank, the Wh should be printed on the product. From memory, 26800mAh is just under 100Wh so you will be fine. i just bought a PD USB-C 20100mAh Power Bank (https://www.ravpower.com/20100mah-portable-charger-iSmart-3.0-Type-C.html). I want to know if it is permited to get in on the plane (in my carry on baggage) and use it to charge my moto z during the flight. it is a flight from budapest to bangkok via amsterdam with klm and airfrance. Yes, this falls within the allowed 100Wh limit. Thank You. I am very pleased with my powerbank! Hi, I have a Lenovo Yoga 920, can you please advise which is the best power bank to use with this laptop and if it is available in Australia? Thanks! Australians right now have limited choice until we are able to stock on Amazon.com.au. If you don’t want to pay big $$$ at a Telstra store, check out Sobre. I am not so familiar with the Lenovo Yoga 920 but it seems like you need a power bank with USB-C.
Hello, I am planning to buy ‘RAVPower Type C 20100mAh Qualcomm Quick Charge 3.0 Portable Charger’. Can you tell me what would be the Wh for this device and can I carry it on flight? So yes, you can take it on-board. Have a safe trip. I’m looking for a portable charger that will work with a Samsung s7 (restricted to a quick charge 2.0), with 2 ports. Any suggestions? Try this 10000mAh Portable Charger. Just purchased the RAVPower ace series 22000mAh portable charger and it came with a sticker on the shipping box stating forbidden in passenger aircraft. Is this true? Because in the answers above, you say that it is allowed on the plane. It did? That’s very strange since power banks are very much allowed on planes. I guess I will need to stake the hallowed halls of RAVPower HQ to find out why this was included. Very strange. Will be buying a laptop with i5 & Geforce MX950 to game while on a 15 hour flight. I’m concerned about the plane’s power outlet not charging the laptop especially when it’s battery taken out while plugged. Only option now is to buy a power bank. Is there a power bank you have for this laptop that can be allowed on flight and be used for at least 10 hour gaming? • Does it have a USB-C port? You can try powering it up with this USB-C equipped power bank. • Do you prefer a power bank with an AC outlet and up to 100 Watts? You can try our beastly 27,000mAh Power Bank. Full disclosure, I am not familiar with this model so I cannot guarantee it will provide at least 10 hours. You will have to check the listings and your laptops hardware. Best of luck and have a safe flight. Power banks under 100 watt hours are allowed in your carry-on. It’s just power banks above 100 watt hours that require permission from airlines. Of course each airline has different rules which is why we *insert shameless plug* have made a free eBook that shares the rules a vast majority of airlines have regarding bringing power banks on board a flight. Right here. Click the link, add your name and email and it will automatically get sent to you. As these things happen, check your spam folder just in case it gets lost along the way. Thanks. Also could you please reply to my June 20th question regarding a gaming laptop? Sure. Sorry we missed it. I uaed a 20100 powerbank with klm, airfrance and Air Asia with no problems. You must carry it in your handbag. Thanks, So what does “100.1-160” mean? It refers to Watt Hours – a standardized unit that measures the watts supplied in an hour. Basically if a lithium-ion battery cell exceeds 100.1 Watt Hours, airlines will place restrictions on bringing it on board. Ok, thanks. What does the 160 mean? 160 Watt Hours. We will update the article to make it clearer. so it’s not allowed to take? If it’s less than 160Wh, you can. Hi! We accidentally checkin our 26000 mah power in international flight which is 1 hour flight, can you please tell me what will be the situation? I have 2 (20,000mAh) batteries that both read at 100Wh I’m I allowed to bring them both with me? Depends on the airline you are flying with. Full details can be found in our Flying with a Power Bank eBook. I have a Ravpower Ace Series 32000mAh External Battery Pack. (1) My understanding from your excellent online article, “Are Powerbanks Allowed on Planes,” is that the Wh of the 32000 is 118.4 (32×3.7) , which exceeds the 100Wh allowed. I am correct on this? (2) Your article says that if the Wh exceeds 100, then I must get permission from the airline (Delta in my case) to fly with the Ravpower 32000. How do I go about getting permission from the airline? Thank you. Following up on my question to you earlier today (7-28-2018). I downloaded and checked your “Flying with a Power Bank eBook” and also checked Delta airlines website. Both state that Delta allows up to 160Wh battery bank with carry on luggage. Thus, my new Ravpower 32000 is allowed. Many thanks for your article and the related eBook. Great! Glad you can bring it on board. As for getting permission, I believe you need to declare the power bank before flying and fill out a form. Depends on the airlines. So my power bank is li polymer 20000 5v if I did the math correctly it’s 100wh do I still need permission? You did the wrong math. Use the nominal voltage when calculating. In short, you can bring it on board without permission. Thank you and it wouldn’t matter if it’s solar too! Cool! Can I bring it on my hand carry bag ? I would be happy to hear from an expert like you. Thank you. The 36Wh rating is below the 100Wh limit airlines have. You can safely bring it on. Have a good flight. Sir. Recently I bought 7200 mah power bank. If I keep this power bank with my luggage..it is allowed or not….can you explain…or we need inform them when we are getting boarding pass.. Yes it is allowed. If you do the math, it will show that the total Wh is under 100. Just put it in your carry on and you will be fine. Have a good flight. Is this article still relevant in 2018? Yep. The rules haven’t changed. We even launched an eBook with all the rules airlines have for power banks. It was compiled this year so it has the latest info. Thanks for asking. Can I bring miniso 20 000mAh on board to Australia and US? The Wh is 75 only. I decided to settle on the Nintendo Switch instead of laptop for gaming on long flights. Just want to know, which power bank would you recommend for Switch on a 15 hour flight? Big power and it can be brought on board an airplane. Is a 20100 ok enough for a 15 hour flight too? We wrote an article about charging a Nintendo Switch with a power bank but basically you’ll get about 8 hours. That could be enough since you’re probably not going to play for the full 15 hours AND that your Switch is already fully charged. Since airlines nowadays have USB ports in every seat, how is their charging a Switch on say, a Boeing 777-300ER Economy class, compare to your powerbanks? Can these ports keep the Switch powered while flying? Sorry we have no idea. It’s fair to assume they have a 1A output as that’s the standard output. That said, best to check with the airline/plane. Zaki, from experience, I can’t get an iPad Mini 4 charged on those USB ports. I assume that the Switch is even more demanding. I will be flying a 14-hr long flight soon. What power bank should I use for my IPad and iPhone? What about multiple power banks? For example, what if I bring a 26.000 mAH and a 10.000 mAH with me? Together, they go above the maximum allowed, but individually, they’re under. Any advice? As a general rule, it should be fine but some airlines do have a maximum allowance. We wrote an eBook that lists each airline’s rules. I am planning to purchase the RAV power 26800mAh Dual Input Portable Charger to take as hand luggage on a flight. This is 2cm depth, somewhere on here it says 1.5cm is the maximum allowed size? The restrictions on powerbanks apply to lithium-ion batteries rated above 100 watt hours (Wh) per battery. Anything above that limit is restricted. As far as we are aware, there is not a dimensional restriction, although the bigger and heavier the powerbank the more you will have to carry. For this, you should also bear in mind weigh limits for carry on bags set by airlines. If you are still worried, we suggest contacting the airline directly to double check. Do you think this powerbank is accepted?